The flows are up! Don’t let that steer you away from the ranch. The flows out of Island Park are at 1,590 cfs. Yes it’s true that you are not going to see lots of action in the usual spots out in the middle of the river, however if you slow down a bit a watch you will notice that lots of the bigger ranch fish have moved to the banks. You really have to sit and watch to see these fish. The eats you will see are very subtle. Take a walk in the ranch and find a “fishy bank” tall grass maybe some rocks close to the bank and watch and if everything comes together you will notice a Flav simply disappear under a very subtle swirl, keep watching and you will see it happen again! The smaller fish in the ranch will make noise and you will see them rise with a splash but this is not the case with a large ranch fish. You will barely notice anything at all. If you’re going to visit the fabled ranch water in the next few days come armed with Flavs. A #14 or #16 Flav Nohackle will get some attention as well as #14 and #16 Last Chance Cripple. I would also have some #16 and #18 rusty spinners. Look for PMDs hatching in the afternoons. A #16 Limestone Cripple will serve you well! As always have a good selections of ants and beetles with you. These are great to have with you either during a thick hatch or between hatches when there is not a lot of action. Also as water temps come up land your fish fast! The less you stress a fish the more likely he will live to fight another day. I like Mike Lawson’s rule of three. Take the size of your fly and divide by three and use that tippet size. Size 12 fly divided by 3 =4 4X tippet. Irrigation demand is taking a bit of a toll on the lower river. I think if you’re headed that way, fishing early and late is the key. Keep an eye on water temps and again land those fish quick! Caddis and PMDs are a good idea. I would also have a good selection of small nymphs with you. #16 red lighting bugs as well pink San Juan worms. #16 Spent Partridge Caddis in the evenings is a good idea. Don’t forget to have some #16 partridge orange soft hackles with you. Dead drifting a soft hackle underneath a #16 olive EZ Caddis can work wonders at sundown! 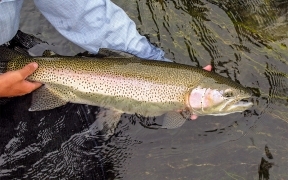 Again get these fish landed and released a quick as you can. Hero shots can wait until fall when water temps come back down. The South Fork is on fire! Of course not literally but figuratively. I think you be hard pressed to find better fishing in our region. You will find both salmon flies and golden’s. You will find green drakes, yellow sallies and Pink Alberts! Concentrate your efforts from Cottonwood on down. You will find almost as many boats as you will find insects hatching but that is one of the great things about the South Fork! It’s a big river and you can always find a place to fish! # 16 pink Nohackles will fool fish that are feeding on Alberts in the riffles. You can fish #6 Henry’s Fork Foam Stones in tight on the banks and have a great day. I would also have #16 tan or yellow simulators in your fly box. If you’re on the upper you can expect the same! Fish the big bugs in tight! When I say tight I don’t mean a foot from the bank I mean tight. As in an inch if you can. You will put flies in the danger zone for sure but if you fish some heavy tippet as in 1X or 2X you should be able to get most of your flies back. Have fun on the South Fork but please be careful as this is big water and things can go wrong in a hurry so be vigilant on the sticks and show some respect to your fellow anglers. 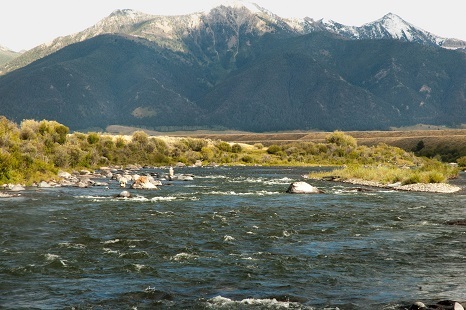 Flows have remained steady at 14,000 cfs. The big bugs are on the Madison! The Upper Madison is about as good as it gets right now. With daytime temperatures peaking in the high seventies to low eighties and 300 cfs more water in the ditch since last week, the fish have been staying cool and have been very willing to eat dry flies throughout the day. Right now expect to encounter Salmon Flies, Golden Stones, 4-5 different species of caddis, PMDs. Yellow Sallies, and even a few Green Drakes if you head out there. The bulk of the Salmon Flies are currently between Three Dollar Bridge and Palisades, and you will find plenty of Goldens from the Slide Area all the way down to the Ruby Cliffs. As far as the big bug fishing is concerned, this has been the best year we have had since 2013 and fish have been eating the big dry from daylight through dark when you dial in the right bug. Some mornings have been a lot better than others, but the action seems to really heat up from late morning through the evening hours. Some of our better patterns this week have been Henry’s Fork foam stone #6 and #8 and Henry’s Fork golden foam stone #8 . The evening caddis hatches have also been incredible over the last week from 6:30 p.m. until dark and a #14-16 X-Caddis or EZ Caddis in tan and olive will get lots of attention. Also swinging a partridge soft hackle or Lawson’s Caddis Emerger in tan or olive will work well. The nymph fishing has been good out there too, and we are still doing well on Pat’s Rubber Legs early in the mornings until the caddis start to hatch. #16-18 Two Bit Hookers and #14 and#16 Flashback Pheasant Tails will get it done These fish have been in their summer holding areas for close to a month now, so be sure to hit the heavy seams, buckets, and pocket water and you should do well. 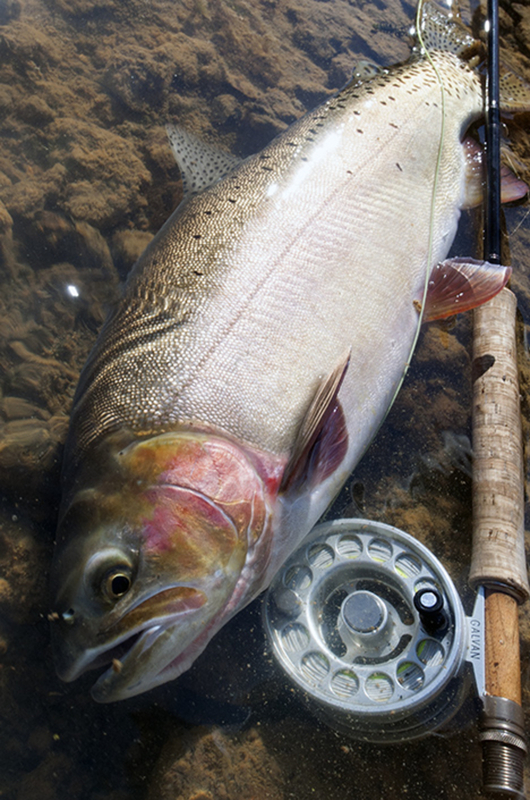 Streamer fishing has been on the slower side with all the insect activity going on, which is pretty typical this time of year. We have gotten a few fish to eat sculpin and bait fish patterns early in the morning, but the bite subsides dramatically once we start to see caddis hatching. The Teton is also in great shape. The upper river is where you should focus your efforts. I would go armed with some EZ Caddis. The evening caddis on the Teton are prolific to say the least. Also bring some Hi-Vis Rusty Spinners with you. We have been seeing some good PMDs during the day so a handful of #16 PMD no hackles is a great idea. I would also have #16 Hi-Vis Spinners for spinner fall in the late afternoon. We have been running lots of trips on the Teton this year and have had some amazing results. I think the Teton is probably one of the best kept secrets in our area. I have heard that Henry’s Lake is slow and some folks are blaming the ice fisherman other folks think it’s Idaho fish and game’s fault. I disagree with all of the above. Its called fishing not catching. How can one complain about catching 3.5 pound fish all day? I my opinion any trout you catch is a gift and if they are small then that means they are going to grow, so just fish and enjoy your day. You may need to work a little harder but I can tell you that there are in fact some very large fish in this lake. I have seen them. I think the key with Henry’s Lake is to just keep working. If you fish a black leech for half an hour and don’t hook up then change the color. I would have an array of different leech patterns and more important I would have a bunch of different colors. We have really beefed up our lake selection this year so come into the shop and have a look. We have been running some trips on Hebgen and have had some great days. The gulpers have not come on super strong yet but that should be happening soon. In the mean time we have had great success dropping red #16 two bit hookers off a chubby and having great success. The wind has been a factor in the afternoon so try to be on the water by 9:00 am. The park has been fishing well. I would focus my efforts on the Madison and the Gibbon in the park. I would bet the Firehole maybe a bit too warm. PMDs and Green Drakes are working well on the above mentioned water. I would also have caddis. 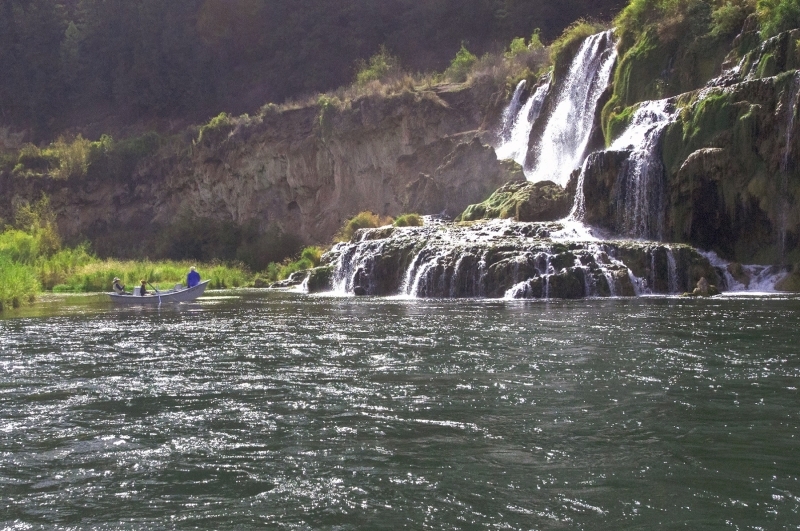 The Yellowstone River is set to open on July 15th and I for one can’t wait! I would have Henry’s Fork Foam Stones in both #6 and #8. I would also suggest some streamers for the Yellow Stone. Gold Little Kim’s and Copper Zonkers just to name a few. We are in full swing at the shop. Open 7 am to 7 pm 7 days a week. The guide reservations are filling fast for the month of July so if you’re interested in a trip give us a call at the shop soon. We still have some great deals upstairs so if you’re in the area come on in and say howdy.